A lucky cat who was brought into us had a miracle escape when she fell from her owner’s moving car on a dual carriageway after clinging on for four miles. Joanne Smith, 34, was travelling at 65mph on her way to a funeral when she noticed something black tumbling behind her Vauxhall Astra. 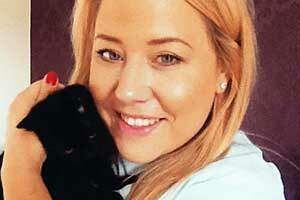 The mum-of-one, who was six months pregnant, was stunned when she saw the object get to its feet and realised it was her pet cat Bella. Joanne quickly pulled over at the side of the A127 in Basildon, Essex, and rang family members to come to help find the two-year-old moggy. She found the terrified cat cowering and meowing loudly in the central reservation and, after her brother had managed to stop traffic so she could scoop up Bella, brought her to our Basildon Cherrydown practice. We carried out X-rays but found the cat didn’t have any broken bones or serious injuries. Incredibly, Bella had only received a scratch to the back of her leg and lost her claws from where she had desperately tried to hang on to the car. She was given a minor stitch-up and has since made a full recovery from the dramatic incident. Joanne, who lives with husband Robert, 34, and son Jacob, five, in Basildon, said Bella had used up her nine lives. The part-time receptionist said: “My friend’s dad had passed away and I was on my way to the funeral at about 3pm. “The A-road was really busy and I had gone to the outside lane to overtake a lorry. “Out of the corner of my eye I saw something black fall from the bottom of my car. I thought it was a plastic bag but then it rolled and rolled and got to its feet and I realised it was a cat. “Then suddenly I had the awful realisation that it was my cat and she must have been under the car. “Luckily she had stayed in the central reservation and when I got to her she was shaking and meowing. My brother somehow stopped the traffic and I picked her up and took her to the vets. “She only had a little scratch on the back of her leg and all of her claws had been pulled out but that was it. Our veterinary surgeon Sami Da Costa, who looked after Bella, said: “Bella is a very lucky cat. When she was brought into us she was understandably a little shaken.